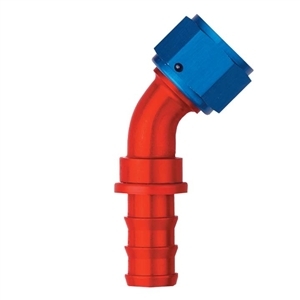 Designed specifically for use with Aeroquip AQP socketless hose, these hose ends are extremely easy to work with. Connecting them is as easy as slipping the hose over the fittings--that's it! Their one-piece design allows for improved flow and eliminates two potential leak points (brazed joints). They're available a red/blue anodized finish.